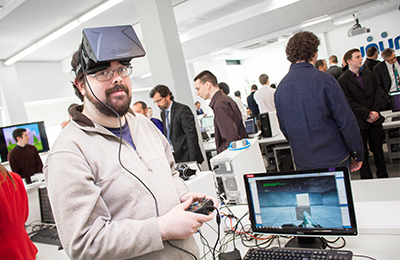 Irish and international software and gaming employers will descend on Institute of Technology Carlow this Thursday (11th April, 2019) to meet with and recruit the cream of Gaming and ICT talent at the Institute’s annual Showcase of Final Year Computing Projects. IBM, Unum and Tata are amongst the companies expected to attend the event. More than 100 final year students will present an extensive range of ideas and technologies in the areas of games, software engineering, IT management and data science. Games Development and Software Development projects on show straddle the most up-to-date technologies. They include: AI for the Visually Impaired; Property Price Predictions; Drone Traffic Control; Solar Energy Exchange; Virtual Reality in the Classroom and the Gamification of Corporate e-Learning. The Computing Department has been a central and productive component at Institute of Technology Carlow for well over a quarter of a century. During this time, the department has developed and enhanced its reputation for producing industry-ready graduates for leading national and international companies. Work placements are part of all undergraduate ordinary and honours degree programmes, including Software Development, Information Technology Management, Interactive Digital Art and Design, Computer Games Development and Cybercrime and IT Security. The department has strong collaborative relationships with key local, national and international ICT organizations ensuring that students acquire up-to-date skills. Demand by employers for graduates is very high, according to programme directors, with many of Institute of Technology Carlow’s final year computing students already in receipt of at least one job offer within the computer game industry and ICT sector. Alumni are working for global leaders including: UNUM; IBM; Microsoft; SAP; Amazon; Apple; Intel; HP; AOL; SAGE Aeria Games; Sony Entertainment; Google and GameSparks. “The digital games sector demands constant innovation and the quality of design and programming has made huge advances since the games course was first introduced at IT Carlow. Our students are highly regarded by the top game studios in the world”, commented Nigel Whyte, Head of Computing, Institute of Technology Carlow. The department has in excess of 30 highly qualified academic staff, committed to the ongoing progression and development of the department for the betterment of over 500 students currently enrolled. Students enjoy state-of-the-art computing and laboratory facilities with a recent investment of €350,000 on virtualisation technology, typifying this commitment to supporting and enriching the students’ undergraduate programme experience.